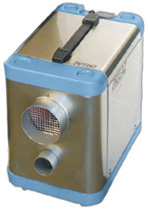 The Dri Eaz DriTec Pro150 Desiccant Dehumidifier is a specialist unit bringing the unique characteristics of desiccant dehumidification technology to bear in low temperature, low humidity conditions. Unlike a refrigerant dehumidifier this unit can operate at temperatures well below the freezing point of water and will extract moisture from the air even when humidity is too low for a refrigerant dehumidifier to do so. The DriTec150 is ideal for specialised restoration work and other demanding commercial applications. The DriTec Pro150 is a powerful desiccant dehumidifier which will operate effectively in the lower ranges of temperature and relative humidity where refrigerant units are less effective or ineffective. A desiccant dehumidifier draws air across a rotor filled with a desiccant, typically silica gel, which absorbs moisture by means of a chemical process rather than by condensing the moisture on cold coils. The rotor is warmed to release the moisture and the warm, moist air may be passed over a condenser and collected or drained. Alternatively the wet air is simply passed out of the unit and expelled outside the drying area via ducting, the system used by the Pro150. This unit, therefore, needs no drainage arrangements but will require ducting for the moist air and a duct ring is incorporated in the dehumidifier. A second duct ring in also provided to allow the warm dry air to be ducted if required. The Pro150 has two fan speeds and it is important to follow the instruction regarding ducting for each speed. At low speed it is recommended that 13 foot hoses should be used for both air flows while at high fan speed 32 foot hoses are recommended, again for both air flows. Desiccant dehumidifiers have a lower water extraction capacity than refrigerant units and use more energy. Despite the apparent disadvantages the DriTec Pro150, like all desiccant dehumidifiers, has advantages over refrigerant dehumidifiers in particular sets of circumstances. A desiccant unit is capable of effective low temperature operation. The DriTec Pro150 will not suffer from ice formation because it is not using refrigeration and is able to operate at temperatures down to 0°F, 32° below the freezing point of water. Refrigerant dehumidifiers are generally unable to work below freezing point. The DriTec Pro150 will also perform more effectively in conditions of low relative humidity, below 60%, and draw moisture from the air continuously to achieve a greater level of dryness. If one or both of these two characteristics is required a desiccant dehumidifier is the preferred choice. This type of dehumidifier is more effective for drying materials such as hardwood, concrete and tile but would be less effective for drying other items, such as carpets. The Pro150 has a water extraction rate of 27.5 pints per day at 68°F and 60% relative humidity and a maximum rate of 32 pints per day. This should be compared with other desiccant dehumidifiers as comparisons with refrigerant models are, for most purposes, meaningless. It is claimed by Dri Eaz that the Pro150 is the most compact desiccant dehumidifier on the market. Its external dimensions are only 10 x 17.2 x 14.2 inches which is remarkable for its power. The unit is also very portable with a weight of only 28.7 pounds and carrying the unit is made more convenient by the provision of a top- mounted strap-handle which makes the unit easy to move on site or to and from a transport vehicle. It is also designed to be stackable in order to make best use of storage space when not in use, for movement in vehicles and in operation. The Pro150 is a strongly constructed and durable unit equipped with robust rotor technology designed to withstand the tough conditions it may encounter in typical operating conditions. It is not equipped with a humidistat as in many applications this refinement is not required but a wired, remote humidistat is available as an optional accessory if needed. A replaceable air filter is included and the manufacturers recommend that the filter is replaced at intervals not exceeding two months. Controls for the Pro150 are electronic and include an hour meter for the convenience of commercial operators. Click on the link to download the Pro150 Manual.